Digital Storytelling. What is it you ask? Photos, videos, audio, graphics. All assets used to create one compelling story. That is what digital media is right? One story after another compiled from various marketing and digital mediums to captivate the audience. Or is it more than just a photo or a 10 second video clip? Is it a message, a movement or even a game changing motivator that drives digital storytelling? Let’s take a look. We all have logged onto our favorite social media site whether it’s Twitter, Facebook, Instagram… You get it and we see that video that makes us get a little teary, that picture that makes us laugh until our side hurt and that article accompanied by strong imagery that captures our hearts forever. Storytelling, that is literally all it is. The way that image is set up and presented to the viewers, the music in the video that can trigger a single memory or a sentence that won’t ever leave your mind. 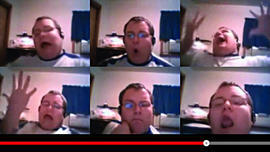 Numa Numa: A video released right in the beginning of the digital power surge. Posted December 11, 2006 by someone who was just trying to be funny and nine years later, everyone still knows what it is and it has over 22 million views. I guess I should really start recording myself more frequently because I sure could become a millionaire quickly if that is all it takes. My point being, humor sells. People love uplifting and funny videos that are catchy and stick with them. I will say I am guilty of contributing to probably at least 10 views of this video.. It is catchy! Props to you “The Geeker”. Ouch Charlie, That Really Hurt! : Of course, then there is my personal favorite. Who doesn’t love these adorable kids with priceless English accents. Views.. over 830 MILLION. Kids… funny kids especially do very well on social media when it comes to going viral. These better be some damn proud parents. But seriously… What is next? It is always something new, but what does the future of storytelling look like? Is it going to continue to be the cute kids, ridiculous people (some who I am confident don’t have brains), people doing disgusting things or will there be some new trend again? You just never know in this day and age but I do firmly believe this has played a huge role in the digital realm today and continues to grow everyday. What’s your favorite viral video? Hard to just pick on right? I love how you begin by relating this out to personal experiences. Isn’t that what storytelling really is? I love to meet new people! I think getting to know them, hearing their stories and experiences and letting them live an experience over again. I am one of those people who really crave to know more about someone when I meet them. I find often it is through my experiences and stories I hear where my marketing becomes more relevant and relatable which is what consumers want. I think you are completely right when saying we need to make our stories more actionable. Trying to get the consumer to respond to something basic is always tricky but with a story, I think you have more creative freedom and liberty to hide the message and call for a response through a compelling and unique angle, where the viewer may not actually see it as a call to action. Really I think the possibilities are endless when making a consumer have a reaction, but they are always changing, and that is what makes our jobs so difficult! I think there’s amazing opportunity to use technology in artful ways to create compelling stories. By using a blend of images, sound, words and video, we can create emotion and creative tension. We can inspire. We can educate. We can connect. We can humanize our brand. I completely agree with you on this. By creating a unique and engaging story to connect at a deeper level with your customer isn’t what it’s all about. Yes, it is nice but if you can move them in a special way and make yourself memorable amongst others through the use of storytelling, then I would say you are doing pretty good.